So, my last post was almost a month ago…I’m already off to a bad start. Blogging, that is. What have we been up to you ask? Hmmm, where to start. I might as well go back 3 weeks but I’ll try to keep it short. I picked Willy up from the airport on Wednesday afternoon, 9/1/10. I was able to meet him at the gate but it took longer than I expected to get a pass so I arrived at the gate minutes before his plane disembarked. I was worried I wouldn’t recognize him from his pictures and that we would miss each other but there were no problems. 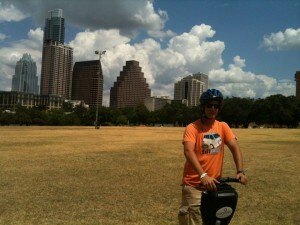 Thursday , we met Matt for lunch downtown then went on a segway tour of downtown Austin. It was a lot of fun and I think Willy enjoyed it too. About 10 minutes before we the tour was over I kinda freaked out because I realized that he isn’t supposed to drive while he is here. I later found out that segway is ok! Friday we were supposed to float on the Comal river, but it was rainy so we went to Natural Bridge Caverns instead. Registered for school on Tuesday – it took more than 2 hours, was pouring down rain, his drink exploded in his bag and dripped all over the floor of the registrars office. Willy took it really well. I have to keep reminding myself that he is only 16 (soon to be 17) years old. He seems so wise and mature. I was definitely not that mature at 16. I also did not expect to feel so awful leaving him there for his first day of school in America. I imagine it is similar to how parents feel when they drop their kindergartener off on the first day. I worried that no one would talk to him. Would the kids be nice? Would he have trouble finding his classes or have someone to eat with during lunch? I didn’t need to worry, the rest of the day (and week for that matter) went much more smoothly than the first 2 hours. The next 2 weeks went by quickly and without explosions. AFS meeting, can’t remember what else except that when I got home from work on Saturday the guys told me they decided “we aren’t doing anything today”. That was ok by me! Sunday was a birthday lunch at Matt’s parents then to the UT campus for the last day of the Our Body exhibit. Willy is going to cook an Italian dinner for us this weekend. I am so excited to taste some yummy authentic Italian food.Tomorrow afternoon we are headed to New Braunfels to celebrate Matt’s birthday . I can’t believe tomorrow (or today ’cause now it’s after midnight – Happy Birthday Matt!) will be his 3 week anniversary for being with us. Fun fact: Willy told us that in Italy, when you go out to eat for your birthday with friends, the birthday boy or girl pays for everyone’s meal! I think that is a really nice tradition. I am so glad (and I know that Matt is too) to have decided to add Willy to our family. I love having him with us and I am already dreading June 28.